When the going gets tough, the tough get storytelling. This is one of Grimm’s. It centres around that thing of dread, a well. Perhaps it is just a cultural thing, this fear of the depths of a hole which goes deep into the ground, of being stuck down there far from help, utterly alone, wet. It has given rise to many stories. This one goes like this: once upon a time there was a soldier who had been discharged from service because of injuries. He must leave the castle, its security and his comrades, walk through the gate, across the drawbridge and never be part of that tight-knit community again. Disconsolate and rudderless, he struck out across the countryside and just as night was falling he happened upon a cottage. Picture-book, it was. All white plaster and black wood beams. And the garden was replete with herbs and flowers, some of which the soldier had never seen before. A bent old woman was tending the garden. And when the woman turned and he saw her eyes he almost rescinded his request and backed away. For somewhere behind them was a witch, he would swear. And if he was not mistaken, she was malevolent. That took a day and he was obliged to spend the night. She agreed again, as long as he chopped her wood, a labour which took a further day till nightfall. He may stay the night, said the old woman, if he retrieve the blue light from down her well. Icy fear gripped the man. He did not relish being marooned at the mercy of the creature who was manipulating him. But down he went, in the bucket, with the wheel squeaking. A seemingly endless, dank journey. He found the light. But what was it in the old woman’s tone of voice that put him in mortal fear of being left there forever, once she had the light? He told her he would not send it up ahead of him. And she left the well for a while. He would come to his senses. Except that the soldier had a cigarette, and he used the pipe to light it, and lo, there was a dwarf with him down there. Grimm reports that the soldier was unperturbed. His wish was the dwarf’s command, it seemed, and the witch was done away with and a route found out of the well, sharpish. And then he requested the princess. Whereupon the princess was brought, and returned to the castle at daybreak with only a strange dream as a way of recalling her experiences.Her mother put dried peas in her pocket so they would drop out one by one, leaving a trail; but the dwarf laid cunning trails of peas all over the city to prevent the soldier’s detection. The next night the princess was summoned again; and hid her shoe under the bed to leave a fatal clue. The soldier’s rooms were searched, the shoe found, and the soldier clapped in jail.He was condemned; and his final request? A cigarette. Lit by a blue light. The dwarf appeared and vanquished the soldier’s enemies. And the soldier became king and ruled with his queen for many happy years. The moral of this story? Always have a handy blue light around for emergencies. You never know when you might be tricked down a very deep hole indeed. Posted in Folk talesTagged folklore, grimm fairy tale, the blue light, wellsBookmark the permalink. useful blue lights. here they have aq different connotation, all sorts of wanna-be-importants have them on cars, drive recklessly and force other road users off the road. Excellent story. Imagine how successful he would have been if he had had a brother to help him. 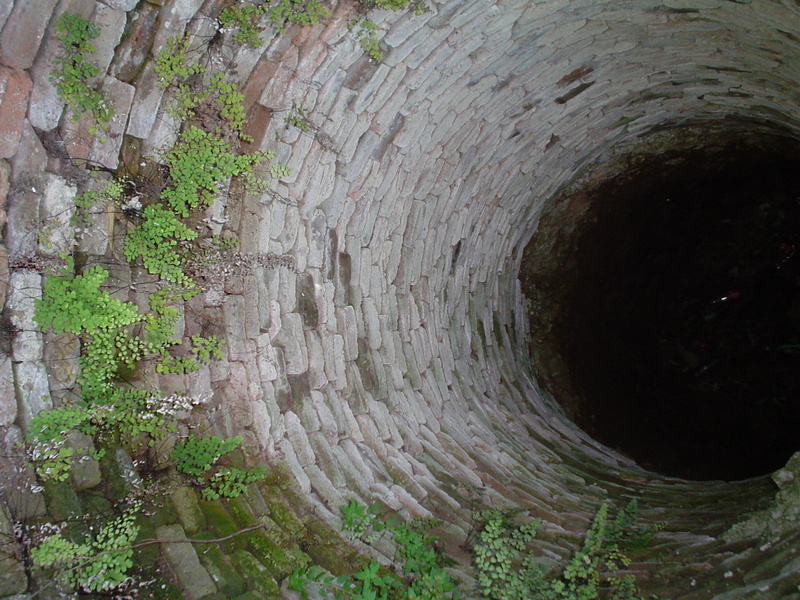 I see a well, I think of ‘Dolores Clairborne’ by Stephen King. A thing of dread, indeed. Wells frequently are, well, the wellsprings of the imagination. This folktale (which I must have read but can’t now recall doing so) uses similar motifs to the Aladdin tale: hero is marooned in a dark hole because he can’t or won’t hand the treasure up to the villain; said treasure eventually produces a genie or dwarf to bring you your heart’s desires; though the course of true love doesn’t run smooth a happy conclusion is eventually reached. The novel I keep meaning to re-read which builds on the idea of questing for the source (the Fountain of Youth, the Elixir of Life or the Holy Grail) is William Morris’ The Well at the World’s End, and your article has just reminded me to check if I’ve still got it in the loft! A good thing to remember, Kate, as I am mortally afraid of the dark. Those blue lights can be useful at times, Kate! Here, blue lights – particularly flashing ones – denote a motorcade for some politician suffering under the delusion that his time is more valuable than that of the beggar who has to wait to cross the road. I’ll have to swap my keychain white LED for a blue one, in case I come across a witch who doesn’t mean me well. Great story. Who doesn’t need a little magic and a dwarf on their side? Grimm’s fairy tales are so grim. I used to read them with great gusto as a child, but this one’s new to me. Thanks for a great share! Off I go to get a blue light, which also works well, I am told, in dark restaurants when reading the menu. Very clever. Outfoxed the old witch and wound up with a princess. Not a bad trade.